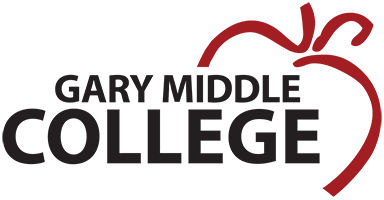 Our students are able to work on their high school degree and also participate in our Middle College dual enrollment program, which presents the opportunity for students to work on high school coursework and also attend Ivy Tech classes for up to 60 hours of college credit for FREE–tuition and books are paid for by GMC, as part of their academic program. Gary Middle College also partners with the Gary Career Center allowing GMC students to take courses at the Career Center. The Northwest Indiana Urban League also partners with Gary Middle College to provide a 6 week college readiness program. We offer flexible scheduling that allows more non-traditional students to attend our school. Gary Middle College operates from 8:00AM–8:00PM with three schools shifts available–8AM-12PM, 12PM-4PM, 4PM-8PM. Our instructional model is the “blended learning” approach. We combine online learning with “face-to-face” teaching by Indiana certified teachers. Our curriculum is rigorous and is aligned with the National Core Curriculum Content Standards. Our individualized instruction proceeds at the student’s pace, offering one-on-one and small group instruction from teachers, and the ability for students to accelerate the time over which they earn high school credit. Our students graduate with an Indiana Core 40 high school diploma and up to 60 college credits. We partner with Ivy Tech Community College and, beginning in their second year, students may take some college courses at the Ivy Tech campus. GMC students also have access to take courses at the Gary Career center. GMC pays the tuition for college courses and the courses are “dual-credit” (meaning they count towards the student’s high school diploma as well as for college credit). While taking the Ivy Tech classes they must continue to be a GMC student and they continue to receive our help and support, so that they will be as successful in their Ivy Tech courses as they are at GMC.